Caring for your tires is perhaps one of the easiest ways to improve ride quality and performance of your vehicle. Tires are what makes your car to stay connected to the road. So it’s fair to say that you want the best possible tire condition that you can get. Here are a few practical tips for caring for your tires and getting the most life out of them. A quick tire inspection can alert you to the need for a tire rotation. Even better manufacturers have guidelines on what is the appropriate length of time to rotate them. The universal rule of thumb is to turn tires every 5,000 miles. Having your tires rotated will help to reduce uneven wear. Uneven wear will cause you to have to replace your tires more frequently or prematurely. There are mixed ideas about where to put new tires if you only purchase two at a time. The best place to put them is in the back. The thought behind this is when you are faced with bad driving conditions the rear wheels will slide more, so having the better tires will allow for more traction. If you lose traction in the rear, the car will spin, so when you get two new tires have them placed in the back. If you can afford to do so, replacing all your tires at the same time is the optimal choice. When you purchase tires using the same one at all four corners makes a massive difference on how a car will handle the road. Applying this same tip when you need to purchase one tire can also help. If for instance, you have a tire blow out, get the same tire if possible. It will ensure the tread is matching giving you the best traction results. It may or may not seem like a natural tip to follow. You’d be astonished as to how many people opt out of having an alignment done when they get new tires put on. A wheel alignment will help to prevent uneven tire wear, and the need for tire replacement prematurely. A wheel alignment is just good tire maintenance service you should do, especially when installing a pair or all four tires. Checking your tire pressure is quick and simple to do. The only tool you will need is a tire gauge. Make sure that each tire has the same amount of pressure. Consistent tire pressure all the way around improves drivability and can help to improve fuel economy. If you have to add air frequently, you might have a slow leak that will require a tire repair such as a plug. Following these simple tips will help to get the most out of your tires, and improve a vehicles performance and handling. 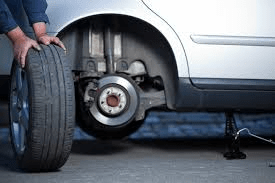 Inspecting your tires is a quick and easy way to stop potential accidents from happening such as a blowout or loss of control in bad weather conditions due to lousy traction.